What Type Of Litter Box Is Best For Cats – Covered Or Uncovered? » What Type Of Litter Box Is Best For Cats – Covered Or Uncovered? The most basic of litter boxes is a litter box or litter tray that is uncovered, closely followed by much the same thing but with a cover or lid. There are pros and cons for both types of boxes. One size doesn’t fit all and we have had several different types of litter boxes over the years, so be prepared, sometimes it is still trial and error. You may be able to pick up a litter box at a yard sale for pennies. This is fine, just give it a good wash, disinfect and rinse thoroughly as the smell of artificial scents used in cleaning products can definitely deter a cat from using a box. If your cat flings litter around but you are not keen on a covered box, look for a box with high sides. Be aware that boxes with high sides may not be suitable for kittens or senior cats if the front opening is also high but everything else in between should be fine. This box does have high sides​ ​ however it is ​is also suitable for kittens and senior cats because of the low opening at the front. A crawling baby may decide to explore an uncovered litter box so this could be a good time to have a closed litter box unless you can make the litter box inaccessible to the baby. A Door Buddy is ideal ​to keep the baby and the litter box separated. It keeps the baby out of the litter box whilst still allowing the cat full access. It's hard, no actually impossible, to be everywhere at once when baby is on the move. Cats like to be able to take off in a hurry, which is a good reason for using an uncovered box. You do not necessarily need to purchase a purpose made litter box, a plastic container that suits all the size requirements for your cat is fine to use. Regarding size, think one and a half times a long as your cat, approximately. Some people cut a doorway in the longer side of a plastic container. The reason for the door being cut in the long side of the box is that, as the cat enters, it is forced to turn around to accommodate body length and this means pee cannot accidentally fly out of the opening. ​​Make sure the opening is cut a little higher than the ​litter level​. Obvious point I know, but we do forget these things sometimes. which uncovered litter box will be best for your cat and your household? Some cats fling the litter around so if the mess is a problem, a covered box could be an option. The upper half of the boxes unclip (see photo above) so the top can be removed for easy cleaning however this can be a hindrance for some people. Not all enclosed boxes have to have the top removed for everyday cleaning. Several manufacturers of closed litter boxes have addressed this issue. The new Nature's Miracle box has a flip top opening that increases the size of the opening to make scooping easier. The Catit box has a door/flap at the front where the cat enters that can also be flipped open, and it stays put making it easy to scoop particularly when using a clumping type of litter. Covered boxes often have a filter so there is ongoing odor control however being enclosed also means that the odor can get trapped in the box. As cats have a keen sense of smell this can be off putting for the cat unless the box is scooped regularly, at least once a day and preferably more often. Out of sight often means out of mind and an enclosed litter box may not be scooped as often as it should be, simply because it is not obvious to the eye that it need scooping. Aesthetically covered boxes look better as the litter is not on view. This may be relevant if your living space is small. If your cat is happy with a covered litter box, there are some fantastic covered litter box options that fit with home decor. If you decide on a covered box, make sure that it is large so that the cat doesn't feel trapped and can easily turn around. There is not as not as much air circulation in an enclosed box, so it takes longer for the litter to dry. The dust from some litters can cause problems for asthmatic cats in an enclosed box. 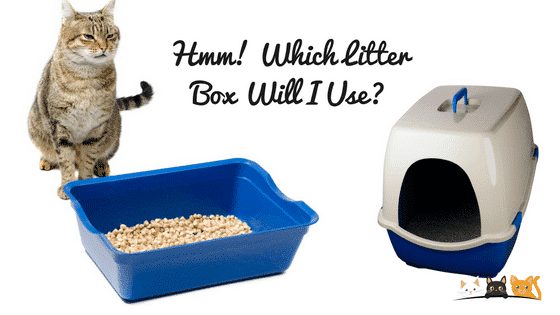 How do you know which Covered Litter Box will be best for your cat and your household? The very best thing for a cat and the litter box is simply keeping it clean, scooping at least once daily but definitely more often if possible and emptying and washing the litter box regularly. How To Look After A Litter Box? How Big Should The Litter Box Be? How Often Should The Litter box Be Scooped? Can Cat Litter Be Flushed Down The Toilet? Can I Compost Cat Waste? What is The Danger In Cleaning The Cat Litter Box To Pregnant Women? How Do You Dispose Of Cat Litter? Do I Need A Cat Litter Scoop? How Often Do You Need To Clean the Litter box? What Do You Use To Clean a Litter Box? Where Should the Litter Box Be Located? Should I Use A Litter Box Liner? How Much Litter Should I Use? Previous Post How To Look After A Litter Box Next Post Have You Ever Seen Cat Wine Glasses? They Are Real!